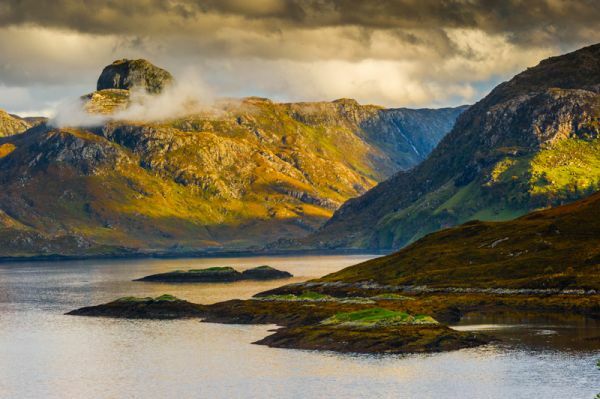 The first geopark in Scotland, the NWSG is the least populated area of Scotland, a region where the wildlife vastly outnumbers the people, and lonely mountains slumber in undisturbed splendour. 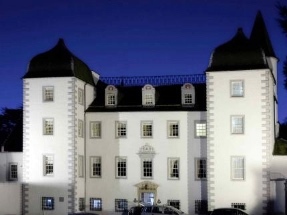 The park encompasses over 2000 square kilometres of territory, much of it uninhabited, stretching from the north coast of Sutherland to the southern boundary of Wester Ross. 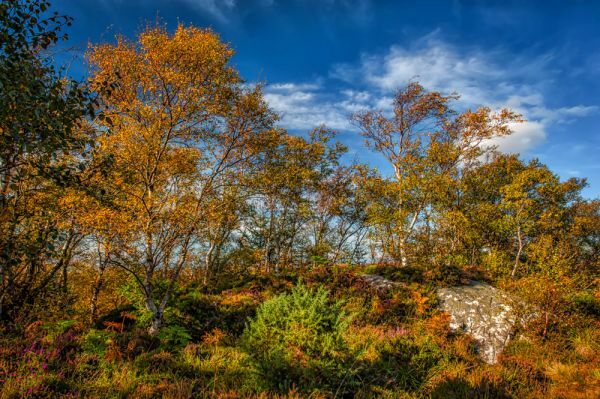 This is an area of mountains, forest, craggy coastline, sandy beaches, and peat moors, bounded on the east by the Moine Thrust Zone, a geological formation that is still helping shape this remarkable region. The concept of a geopark is a fairly recent one and perhaps deserves some explanation. A geopark is, or contains, at least one area of outstanding scientific interest, be that due to geological, archaeological, ecological, or cultural importance. The North West Highlands Geopark was created because this area of the Scottish Highlands is home to some of the oldest rocks in Britain, up to 3,000 million years in some places, and offers outstanding scenery and a rich area of geological ecosystems that will keep even an amateur geologist fascinated. But you don't have to be a geologist to enjoy the park; there are walking opportunities everywhere, and the chance to enjoy a superb landscape of unparalleled beauty. The administrative centre of the Geopark is in Lochinver, on the west coast. The park is divided into four areas; in a north to south direction these are Cape Wrath, Eddrachilles, Assynt, and Colpach. The Cape Wrath area is centred on the Durness Visitor Centre. This area offers excellent climbing, with the most northerly Munro (peak over 3000 feet) in Scotland, Ben Hope. If you don't fancy a climb, the famous Smoo Caves are at sea level, and Balnakeil church was founded by St Maelrubha in 722 AD. 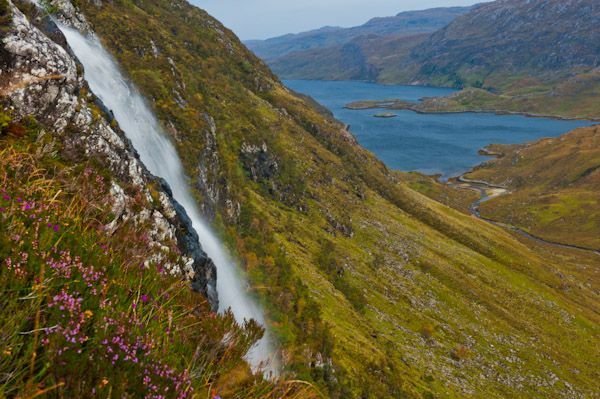 The Eddrachilles region takes in Glen Coul, and Eas a' Chual Aluinn, the highest waterfall in Britain at 200 meters. Perhaps the most interesting place in this section of the park is Handa Island Bird Reserve, a remarkable island that is home to 200,000 breeding seabirds including guillemots, razorbills, puffins and great skuas. The Assynt area of the park has its own visitor centre at Lochinver. 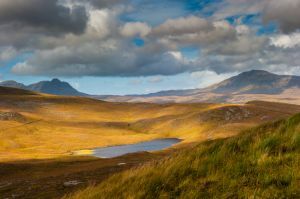 This area is home to Loch Assynt, around which cluster several interesting destinations. 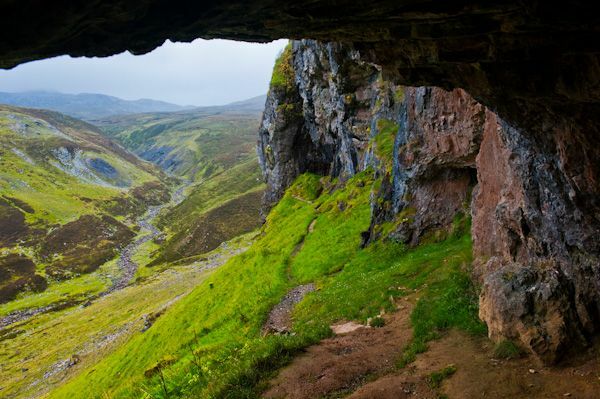 To the south is the Inchnadamph National Nature Reserve, offering caves, tunnels and underground streams. You can walk the dry riverbed at Traligill and visit the Bone Caves, where archaeologists unearthed human remains dating back 4500 years. On the shore of the loch is Ardvreck Castle, the ancient stronghold of the MacLeods of Assynt. Further south is the final region in the geopark, Colgach, where you will find one of the most popular peaks in the park, Stac Polly. 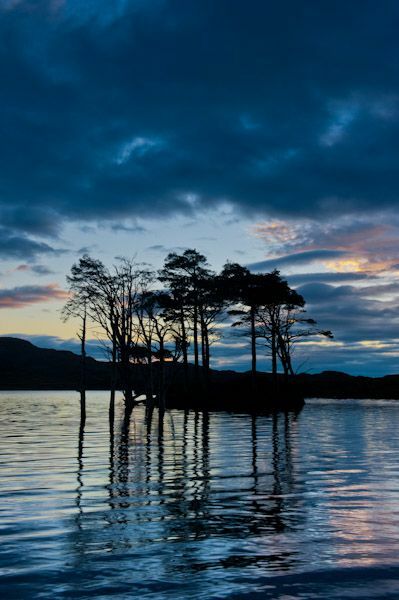 There is a visitor centre at Knockan Crag, where you can learn more about the natural history of north-west Scotland. Offshore are the Summer Isles, a popular area for diving, kayaking, and cruising. Visit Tanera Mor, the only inhabited island, that used to print its own postage stamps! 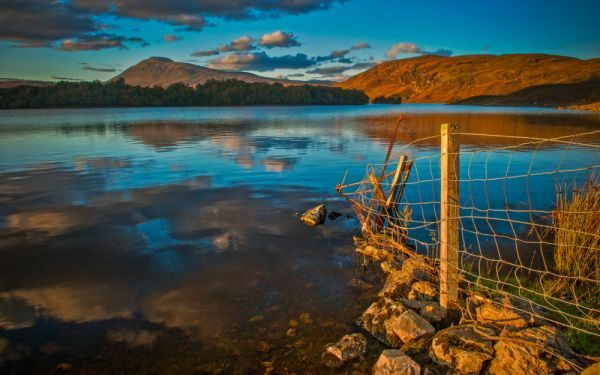 This is just a taster; the geopark is a vast area, with a wonderful array of scenery and recreational opportunities, an area where wildlife and natural beauty reign. For more information, visit the official Geopark website. Nearby accommodation is calculated 'as the crow flies' from North West Highlands Geo Park. 'Nearest' may involve a long drive up and down glens or, if you are near the coast, may include a ferry ride! Please check the property map to make sure the location is right for you.